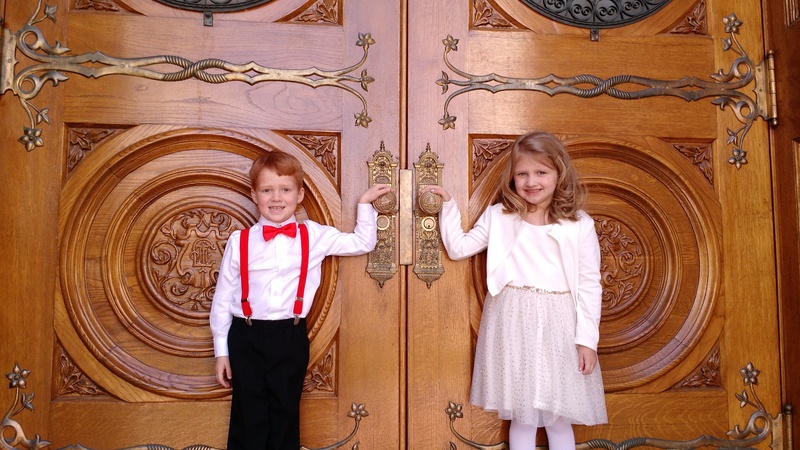 For Easter weekend, we went to a wedding in Utah. 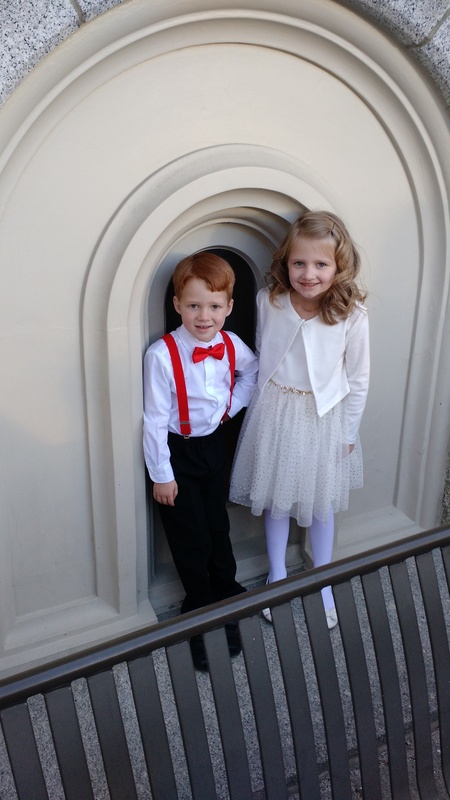 The kids were a little more dressed up than normal, so I thought I would share a couple of those photos. There were many more, but these were just from the ones that I took. I am happy spring has finally arrived. 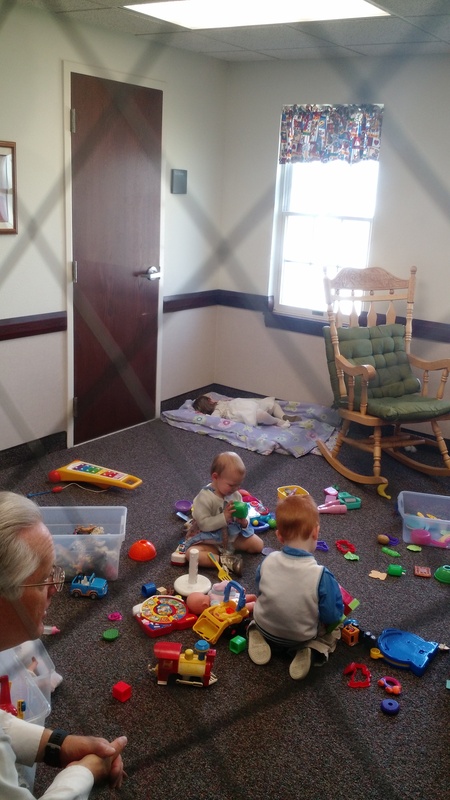 Lillie passed out in Nursery from wedding exhaustion! Maybe it is a product of our day where people live longer, but Aliza is fortunate to have 3 of her great grandparents living at this time. 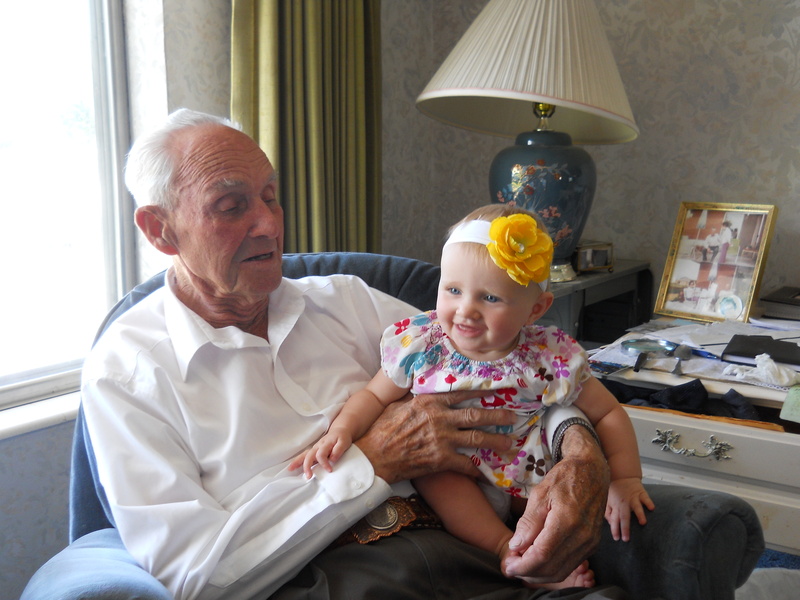 For family history purposes, I thought I might post these pictures of Aliza with her great grandparents. 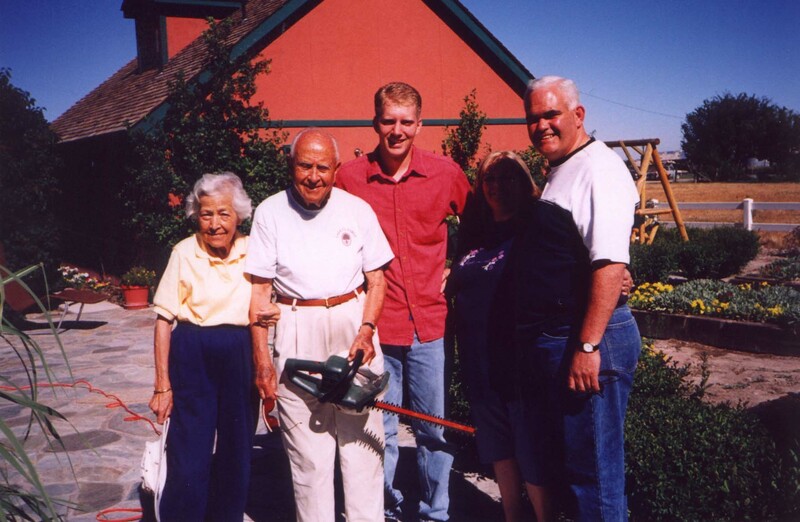 Further, I thought I would post a picture or two that Amanda and I have with our great grandparents. Here is a picture of Aliza with Amanda’s paternal grandfather, DeLece (“D”) Hemsley. This picture was taken at a party in Kaysville, Utah for Amanda’s brother, Derek, upon coming home from his two-year mission in July. We took the opportunity for a couple of photos with family. This is Amanda’s paternal grandmother, Shanna Thompson. This photo was also at Derek’s party. Lastly, here is my paternal grandfather, Milo Ross. We took these pictures, the day after at Derek’s homecoming party, at Grandpa’s house in Plain City, Utah. I will post three pictures because I think they are good photos. 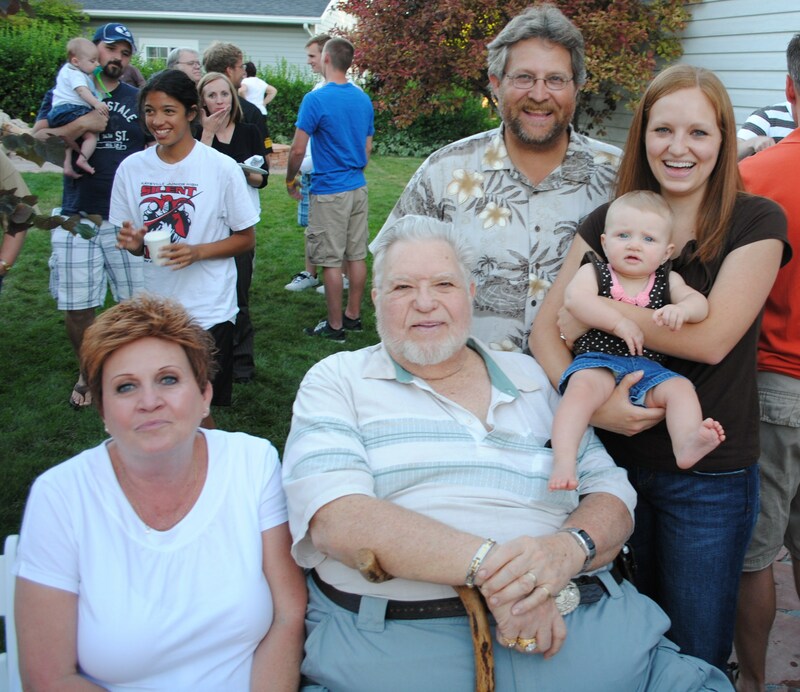 This first one shows a great smile on Grandpa, Aliza, and Amanda. I also like the profile of Grandpa. I like this one because Aliza looks as cute as she always does. For being 90, Grandpa can sure pick her up and throw her in the air with ease. 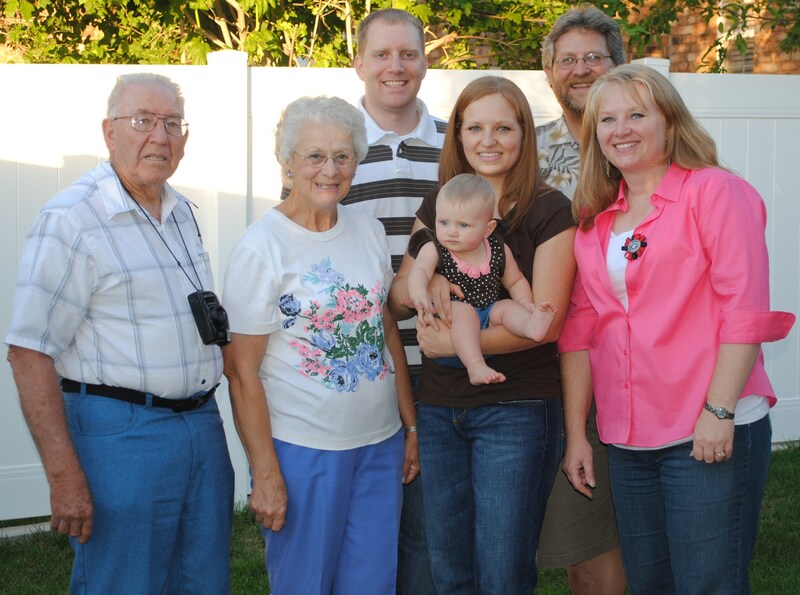 Here is one we took of the four generations with my sister, Andra, and her son, Daniel. 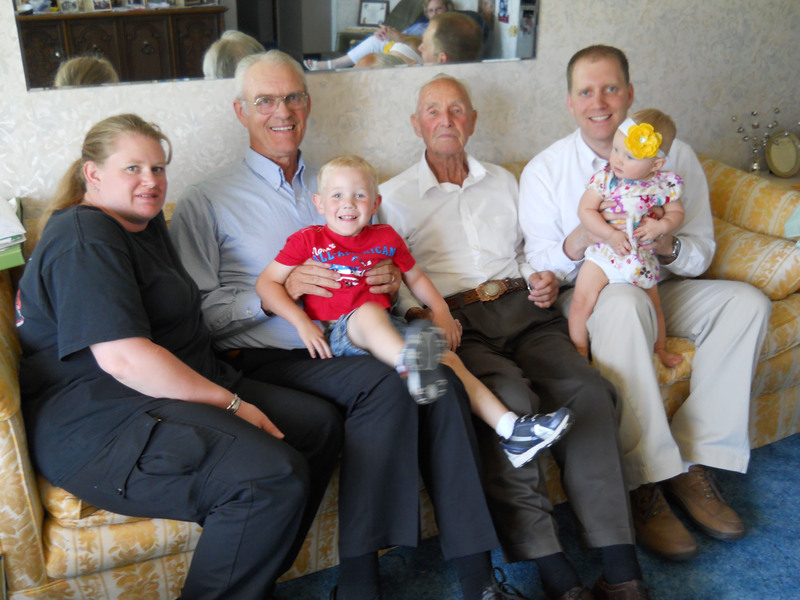 Grandpa has two of his great grandchildren in this picture (and Dad has two of his grandchildren). Fortunately, Aliza has now had her photo taken with all of her living Great Grandparents. 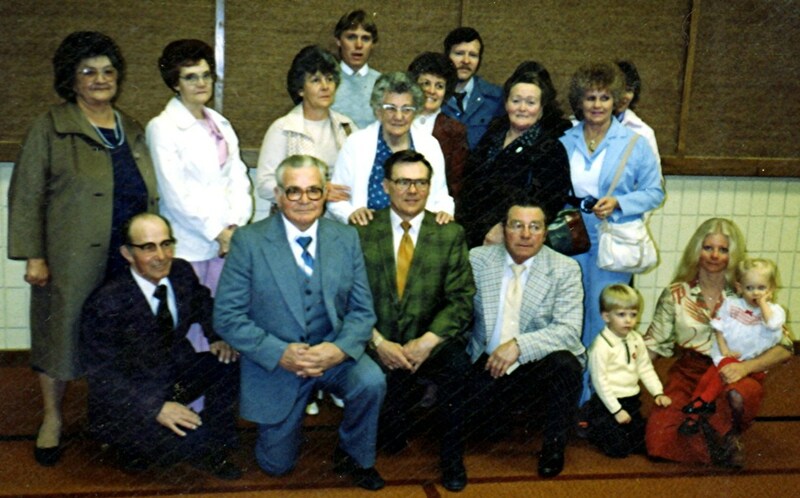 Amanda was also fortunate to have such a photograph with all of her living Grandparents and Great Grandparents. 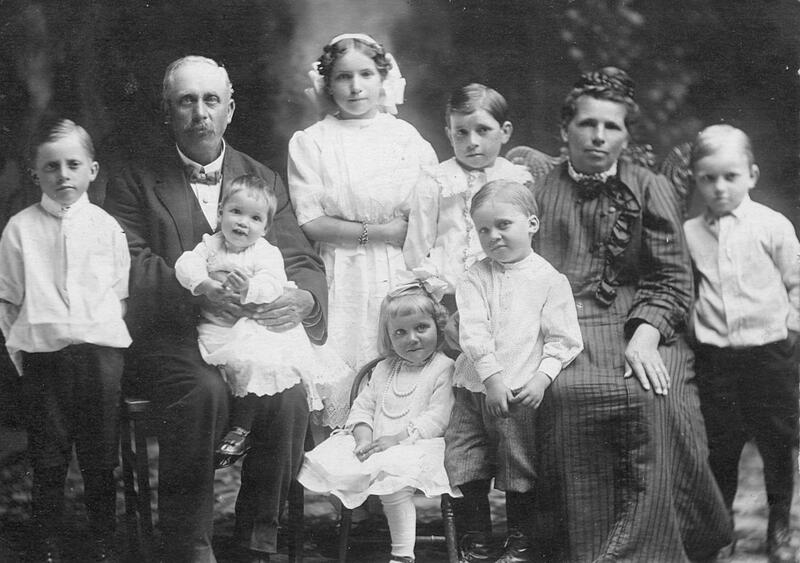 Even more, ALL great grandparents and grandparents are in the same photo! 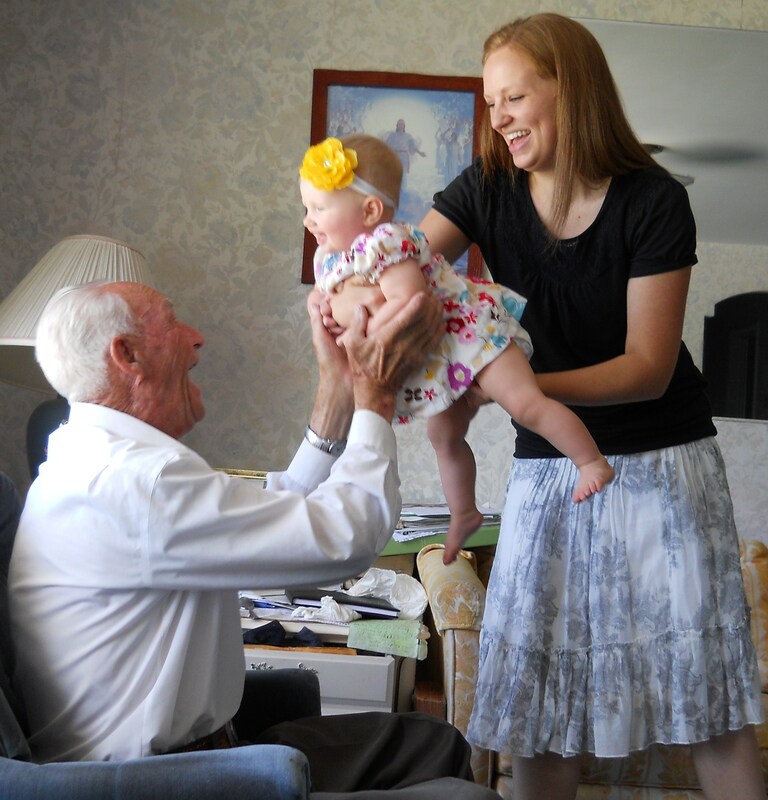 Here is that photo from the day of her baby blessing in Kaysville. LeRoy, D, Shanna, and Clara are all Amanda’s Grandparents. Belle is D’s mother. Walter and June are Shanna’s father and step-mother. Back (l-r): LeRoy Holden, D Hemsley, Bryan, Jill, and Amanda Hemsley, Mel and Shanna Thompson. Front: Clara Holden, Belle Hemsley, June and Walter Hansen. I had three Great Grandparents who were alive when I was born. Unfortunately, I do not seem to have a photo in my possession with my Andra Great Grandparents despite the fact that I was 10 and 11 years old when they passed. Oddly, I have pictures of my Great Grandpa and Grandma Andra that I was present when the photo was taken, like the one below. 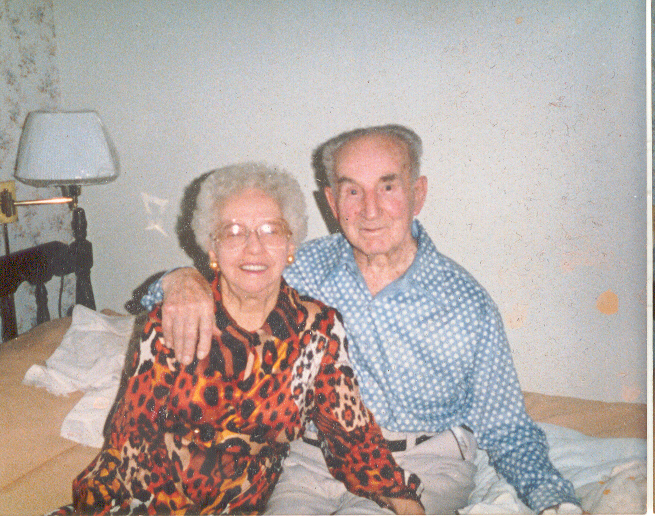 This is my mother’s maternal grandparents about 1989. This is my mother’s paternal grandmother and some of the rest of the family at her sister’s funeral, Edna Coley Neilson. My Great Grandma Lillian Bowcutt (remarried in 1953 after her husband Joseph Jonas died in 1932) is in the center of this photo and is the mother to the two ladies beside her and the four men in front. 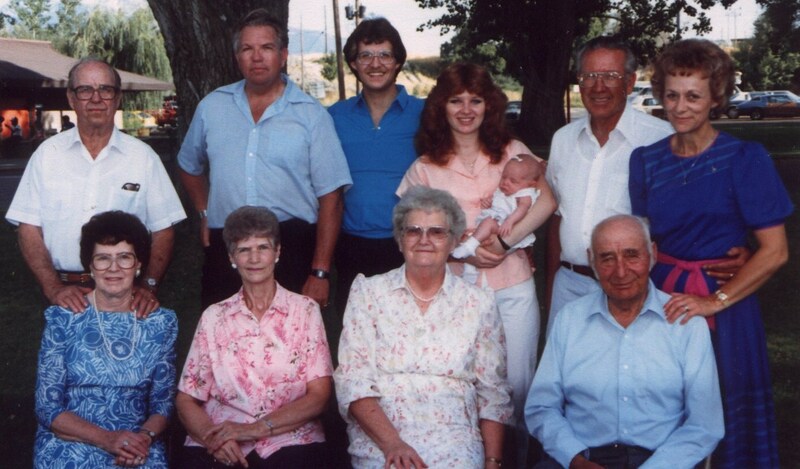 I am more of a footnote in the photo, but at least I have one with Great Grandma Bowcutt in the same picture. Far back (l-r): Unknown, Larry Talbot, Unknown (completely unseen), and Unknown. Middle: Jimmie Jonas, Hilma Jonas, Lillian Talbot, Lillian Bowcutt, LeReta Andersen, Lona Jonas, Colleen Elliott. Front: Spencer Jonas, Joseph Jonas, Ellis Jonas, Evan Jonas, Paul Ross, Jackie Jonas, Andra Ross. A quick update for the week. Cousin Dan Ellis Jonas passed away on the 30th of May. His service in Denver was on the 5th. 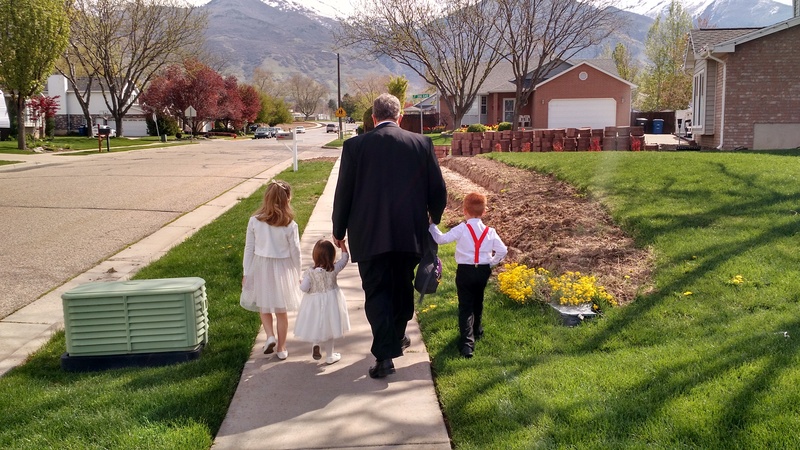 His funeral and burial took place on Saturday in Smithfield, Utah. He was the son of Ellis and Geri Jonas of Smithfield. He had liver problems that required a transplant and when the liver didn’t come, he knew it was a matter of time. He was only 50 years old so I took quite a few of the family by surprise really. I hope all are doing well. The attorney I work for decided to take Thursday and Friday off. Meaning, I ran the office myself on those days. It was an education to muddle through without him after only a week of really doing any of the work. I think I did okay though. Good thing we didn’t have anything serious! This coming weekend I fly out to Idaho for the Andra Reunion in Lava Hot Springs. I fly in to SLC on Friday and drive to Richmond that night for a graduation party for some high schoolers. A good portion of Saturday will be at the Andra Reunion. 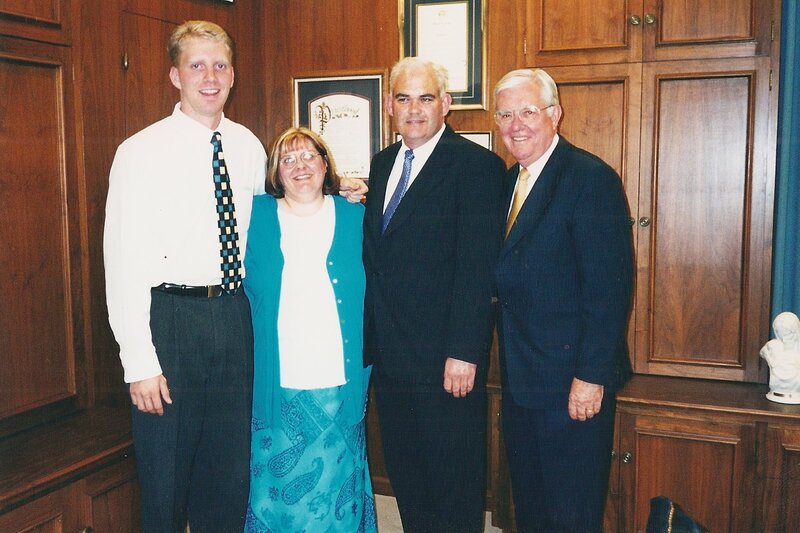 Afterward I run to Kaysville to go to the Bountiful Temple with Amanda’s brother, Derek. I am looking forward to a busy weekend. Then I fly out Sunday morning back for the craze here in OKC. It will be a quickly weekend. Sadly, my skipping the reunion last year means a number have died I didn’t get to see for quite a while. Hopefully we have a good while before any more go. Amanda’s birthday was yesterday. The big 23. I spoiled her with a 8 gig iPod. I thought I was buying her a present that I could also reap some gain from. However, as she uploaded her music and I looked at mine, I found out I have over 10 gig of music on my computer alone. I guess I will have to get my own since Amanda has over 4 gig of her own. It is all hers now. Perhaps she will let me listen on a road trip. I threw a little party for her on Saturday night with my law buddies. Holt and Lindy made home made ice cream. How is that for a party? We played a number of games, chatted, ate Amanda’s birthday cake, and relaxed away some perfectly good hours. Today we had dinner with the Curtis family, who also came to the birthday party. They spoiled us with dinner including lasagna, minestrone soup, and more. We played a game called Ticket to Ride. It was actually quite a bit of fun and we enjoyed ourselves. I recommend it to others. Ticket to Ride and Axis and Allies are both two games that we will have to purchase at some point in the future. Time to turn off and go to bed. On the safari hunts each night killing cockroaches, I have to boast an all time high of 137 in one night. I may have boasted of this fact in the past. I am also happy to report the numbers have been quite a bit lesser since. Tonight was a whopping 38. Tonight also included a camel cricket, 4 slugs, 1 regular cricket, and 2 spiders. The number of cockroaches seem to be falling each night. I hope it continues. There are less getting into the garage and getting stuck on the sticky bug traps. May it continue.